I know it says "The Phantom Pain", but this is definitely MGS5. The barely visible text above where it says The Phantom Pain at the end even spells out Metal Gear Solid V.
It looks interesting but I'm honestly not too hyped for this and I've been a fan of the series since the original PSX game came out. Much of my enthusiasm for new MGS games ended after 4. Would rather see news on a new ZOE. I'm the same way to an extent. I wish it would've ended at 4. Or at least started a new series with a new character that takes place after 4. But I'm curious to see what Kojima does with this. Haven't played a MGS game since 2, but happy 20-25 years MGS and Kojima. I would say I'm definitely more excited for MGS: Ground Zeroes, compared to this. I'll keep an eye out on this game though, especially as they shine some more light onto what this game is going to be about. Kojima definitely loves to troll and tease his audience, that much hasn't changed. The thing I would really like to see or have wanted to see has been a remaking of the first two MG games. MG2 told such a sophisticated story and was well ahead of its time for 1990. It would be great to see an adaption of it on the current consoles. The thing is Kojima will not do it... reason he does not want to spoil the game play. The first time I saw shadow moss in HD, I was WOW... he shoud make a remake.
? Most fans I know say that MGS covered both of the original official games' story and brought it into the world of 3d. I was honestly not sure if I would continue to really follow the series but this brought my interest back up to a real high point. Called it! Well.. Not exactly. I didn't expect it to be both The Phantom Pain and Ground Zeroes. 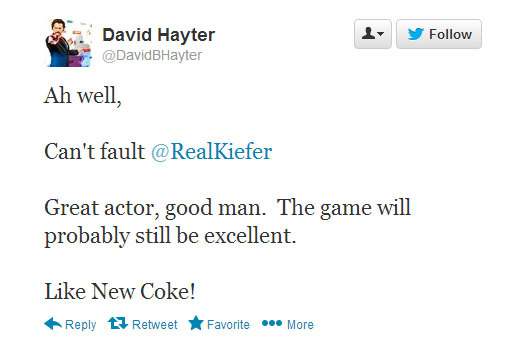 But that voice actor though.. That's no David Hayter. If they ever remake the original MG titles which would be awesome in my opinion. I'm disappointed by this news but would understand if it's due to Big Bosses age since it looks to be set in around the mid-80s. They got Richard Doyle to voice Big Boss before so they might do it again. I think there a twist why David Hayter not voicing for Big Boss, we will hear husky voice in younger snake... Remember guys... "two phantom were born..."
June 6th there will be a new gameplay trailer of MGS:V.
Kojima left us a teaser of the new trailer of in his twitter feed. 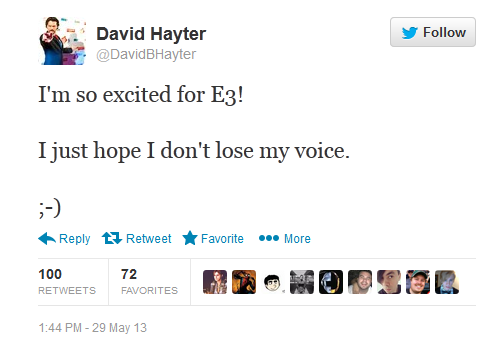 Also a video teaser released by game spot says the new voice actor will be revealed during E3, shortly thereafter David Hayter left this tweet. Kiefer Sutherland is voicing Big Boss. UGH DANG IT. David Hayter's voice would have fit Big Boss so well! 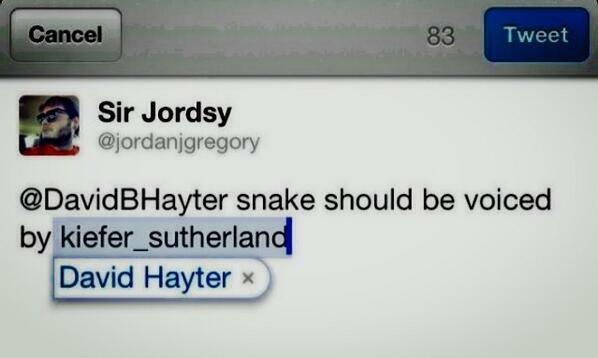 Sutherland will be a good alternative I guess... I'm looking forward to hearing more information as time goes on. Now if only I can get tickets to go to E3 then my life would be complete. Not really upset about this at all. I'm more interested in seeing more about the new setting which will be in 1984. Oh gosh that video was hilarious! Thanks for sharing it. But I liked Snake Eater... How was that a bad game? That music, what music, I love it.